Raindrop began to hit my tent around 530am. Rain? It didn’t call for rain. I looked out and could see a thick fog. Ah, that’s where it came from. I started trying to get up later as to be able to pack at sunrise. Today was no exception. At 730 I made my way to Alexander Springs to use their flush toilets. What was waiting inside made the hair on the back of my neck raise. Two of the biggest spiders I’ve ever seen. They must of been part of the wolf spider family but their body was a lot “juicier” than their legs. Screw it, I had to use the bathroom. Sitting on the toilet, ready to run out at any moment if one of then made a move. They didn’t. Thank goodness. 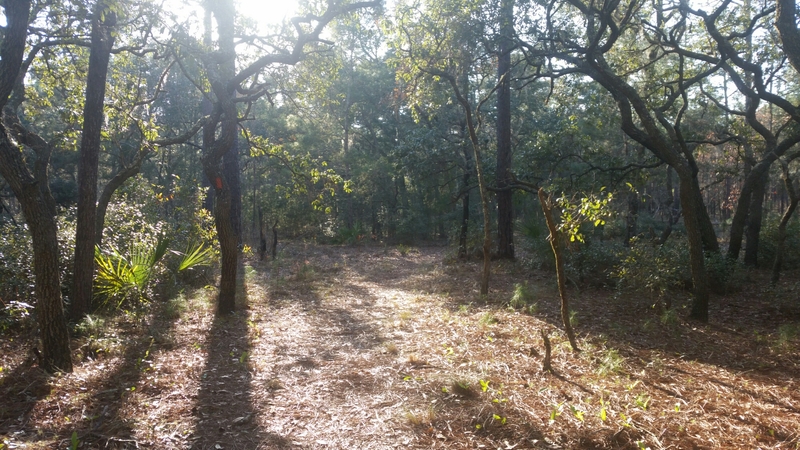 I was back on the trail by 8am. The day started in a thick fog but quickly cleared up to a hot sunny day. It got up to 84°. Sorry guys back in Wisconsin! The hike was entirely in the wilderness. Crossed a street or two but didn’t have to road walk at all. It was lovely! I took a break on a jeep road crossing. Two cyclists came fast down the trail and I watched them pass buy. I thought it was bizarre to see them there. 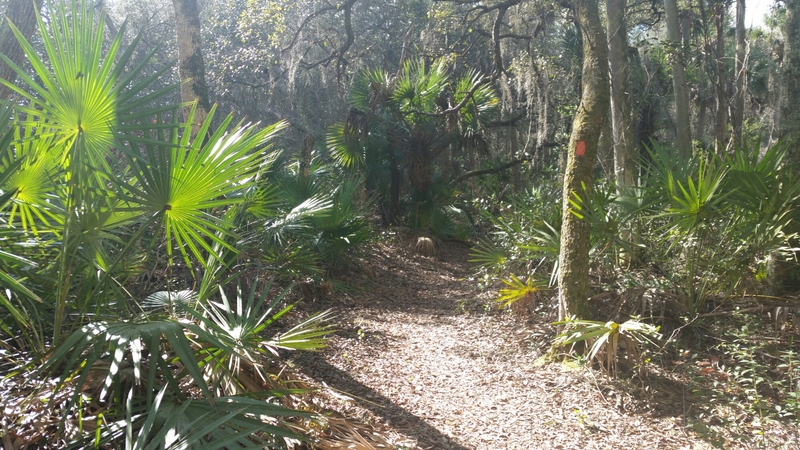 Afterall the trail was for foot travel only… Hmm my break was over and I continued hiking with some music. I farted loudly, because heck, I was hiking alone. Seconds after, I heard a whistling noise behind me. I turned and another cyclist was asking to pass me but didn’t want to scare me. As he passed, he probably got a mouthful of my toots. Ha! 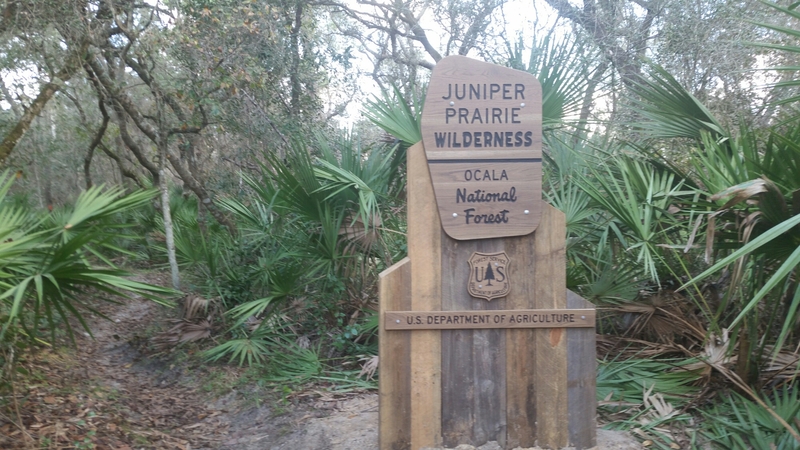 Around 3pm, I arrived at Juniper Springs area. Alex had gotten here before me. I paid for a day use pass and quickly went to the natural spring. There was no crowd but sadly the campstore closed at noon during the week. We swam in this beautiful spring. There was a bunch of little fishes that were surrounding me. I quit moving and realized they were after my feet and legs. Must be the dry skin they were after. It reminded me like one of those asian pedicure you could get nowadays, where you dip your feet in a bucket of water with flower petal and fishes. They eat the dead skin. Anyway, I swam in my short and sport bra and let them air dry in the sun afterwards. Beautiful day. 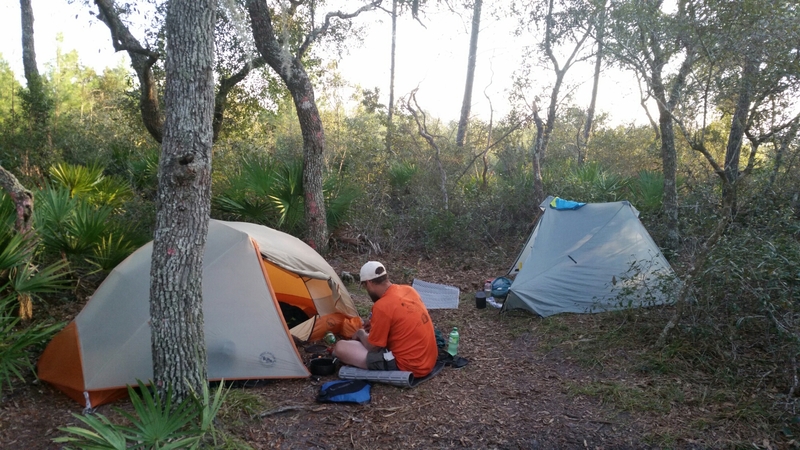 We hiked some more after that to a random campsite on the Florida Trail to avoid paying camp fees. There have been some type of forest fire in the area because it was smokey and smelled like burning. So here we are now, in a tiny campsite on the site of the trail and hoping to make good time tomorrow to avoid the rain at night. Happy trails!! I’m doing that trail next year. Thanks for a wonderful peek into the journey. Humor always wins in rough situations. haha glad you’re enjoying. Have fun on the trail. Remembers, the trail isn’t as wet as I described it in my blog. I had an *extremely* wet year in 2016 because of El Nino. This year, many hikers was having a hard time finding water. Enjoy your hike and make memories! Great point! A video of a hike this year showed how little water there was. I solo paddled the Mississippi River last year. No shortage of water. Lol! That was an adventure of proportions. My Adventures usually go sideways at some point, so I keep my expectations reasonable.. Lol.